Now the 14. album will be released a limited red vinyl with updated cover design as well. 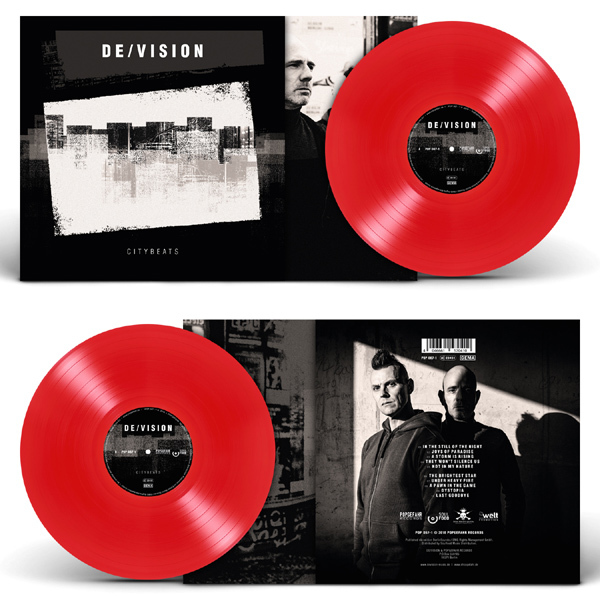 The new DE/VISION album comes with a 24-page digibook (18x18 cm) and 2 CDs; consisting of the standard album (10 songs) and a bonus CD (5 songs). This year German Electro institution DE/VISION not only celebrates its 30th band anniversary, but also presents their all new, 14th studio album ‘CITYBEATS’. The previous album of the Berlin-based duo Steffen Keth and Thomas Adam, provided the duo the highest charts position in the band’s history (11!) so far and encouraged DE/VISION to continue on this road of success with their new album. After Steffen and Thomas broadened their musical horizons again and again during their long career and at the same time exposed a refreshing joy of experimentation, on their new album they have reflected on their most succinct qualities and deliver a collection of unadorned and catchy synthi-pop pearls! "CITYBEATS" impressively demonstrates a further maturation in their songwriting: The musically and thematically complex songs sound refreshingly modern, drifting with distinctive rhythms and grandiose sound design, creating numerous goosebumps that last a long time!